High quality 304 grade stainless steel lockers with a muted polished finish. If you work in a particularly dirty environment and need to keep your clean workwear separated from your worn clothes, then this locker is ideal. Constructed from high quality 304 grade stainless steel, these tough lockers feature a handy central vertical locker divider. And the strong reinforced door ensures that your contents are stored securely. 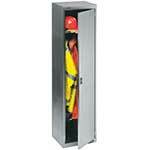 These lockers are particularly suitable for clean room and food production environments.